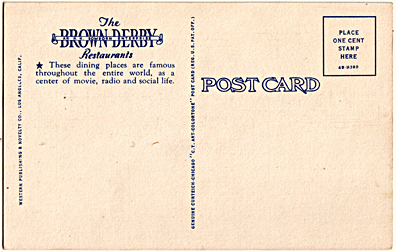 Few things spark our interest (or a sense of yearning and regret at having missed them) as much as postcards, menus, and other memorabilia from once-popular and prominent eateries and night spots that exist no longer. Here in NYC, there are (or, rather, were) such legendary dining and drinking establishments as the Stork Club, Jack Dempsey’s, Cafe Society, Luchow’s (the worst of it, in this case, is that we could have patronized Luchow’s when first we moved here, but what did we know? ), the Copacabana, El Morocco, the Latin Quarter. Thankfully, we’ve still got Bemelmens, the Cafe Carlyle, the 21 Club, Sardi’s, the King Cole Bar, Keen’s, Fedora, McSorley’s—all but one of which we’ve patronized—but it’s all too tempting to focus more on what’s lost than on what remains. 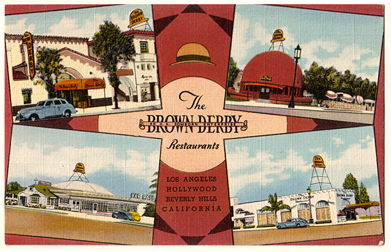 Los Angeles has more than its share of fun culinary and night spots that are still going strong, too: The Frolic Room, the Formosa Cafe, Musso and Frank, Phillipe’s, Pink’s, Clifton’s Cafeteria, Miceli’s, Canter’s, Nate ‘n Al’s—all of which we’ve patronized (and will again). It strikes us odd as we write this that the historic places that remain in Los Angeles—the ones we’ve patronized, anyway—tend to be inexpensive and casual, while most of the venerable spots in NYC, McSorley’s and Fedora aside, are on the tony side. But as with NYC, the list of L.A.’s gone-but-not-forgotten boîtes and beaneries is a long one. We’d give our eyeteeth to dine at Romanoff’s, Chasen’s, Preston Sturges’ the Players, or Thelma Todd’s Sidewalk Cafe or to cut a rug and sip a cocktail at the Cocoanut Grove, Ciro’s, The Mocambo or the Cafe Trocadero, but perhaps most of all, we’d love to hole up for an evening at the Brown Derby. When we were kids, it was the Brown Derby that we read about, that was depicted on television (perhaps most famously in a memorable episode of I Love Lucy that guest-starred William Holden), that sparked our imagination. 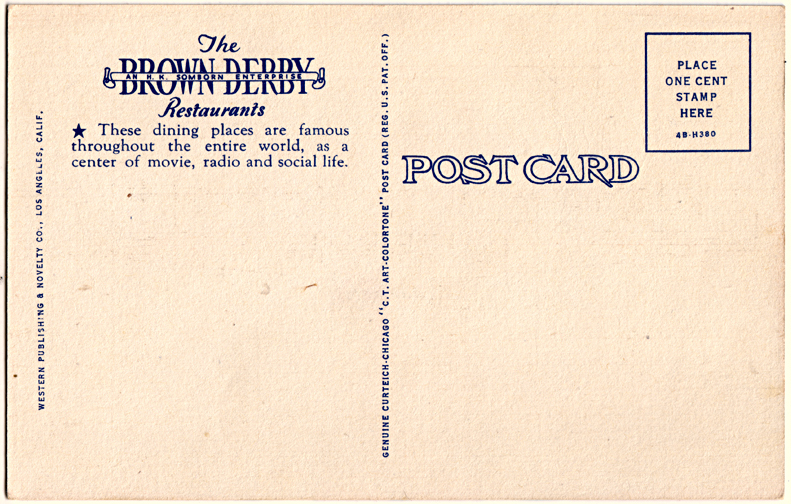 It was the hat-shaped restaurant on Wilshire, seen in the upper righthand corner of the postcard, that was the original Brown Derby, by the way, and that’s the one we most regret not seeing, but the blog Dear Old Hollywood suggests that it was the Vine Street location (the one on the upper left) that was the most popular, because it drew more of the day’s celebrities, which is what drew many of the patrons to the restaurant. We’d happily accept a lift in a time machine back to any of the four locations, and in just about any decade—the 1930s, the ’40s, the ’50s, we’re not choosy. By the way, we’d love to hear from you folks in Southern California (or just about anywhere else, for that matter) about any classic restaurants and bars we might have missed in our travels. Share!